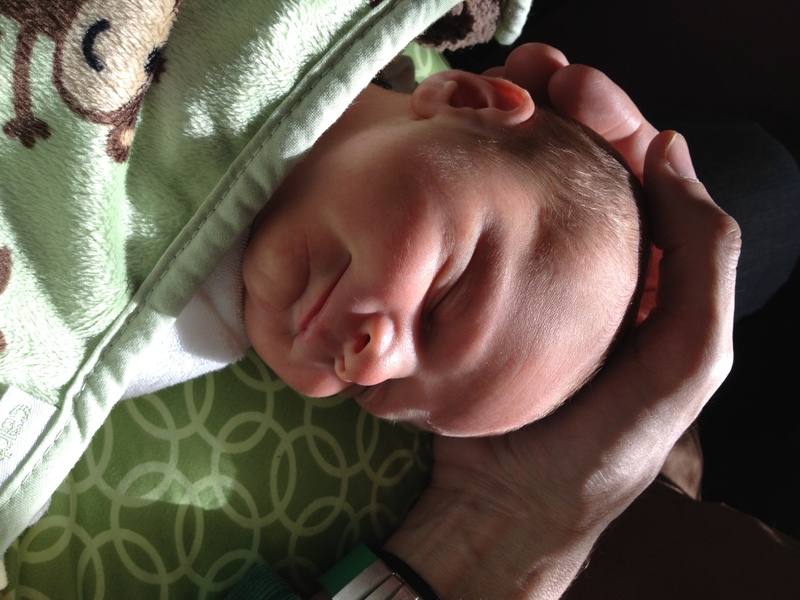 Little Cormac Robert was born on Wednesday, January 23rd, at 7:47 pm. He was 6 pounds, 12 ounces, 19.5 inches. He’s doing great, as am I. Isn’t he a little darling? Yes he is darling, and I’m sure you are reading him plenty of books. Some about bicycling! Oh congratulations! This has brought tears to my eyes in recognition of all you have ahead of you. Cormac is a great name, too. Sending love and hugs! Congrats!! Look at that contented grin. What a darling! An absolute darling! I just love this picture. He’s a gorgeous little guy. Congratulations! What a happy-looking little guy! Congratulations! All the best wishes for little Cormac and his parents ! Man, is he adorable. Congratulations to all three of you! Oh Congratulations! The Bears are doing a war dance round the living room and they will be unliveable with for the rest of the day (week? month?). We are all so happy for you. Congratulations to you all! He is adorable! Congratulations! I’m glad he arrived safely and that both of you are doing well. Hi, little guy! Congratulations all around; oh, I’m so happy for you. Also: WEE BABY! Congratulations! Thank you for letting us know! Congratulations 🙂 What a cracking name! Absolutely gorgeous – wow. Congratulations! Congratulations – he is just absolutely amazing! And I love his name. Many congratulations to you, Cormac and the Hobgoblin! He’s beautiful! Glad you both are doing well. Have fun getting to know little Cormac! Oh my gosh, he’s absolutely beautiful! Congratulations. Wishing you and your little family all the best! Mazel tov! What a great photo of a beautiful beautiful little green peanut! Soooooooooo cute. And he looks like he can’t wait to get into some good reading. And bicycling! Adorable! So glad to hear you are both doing well ~ congrats!